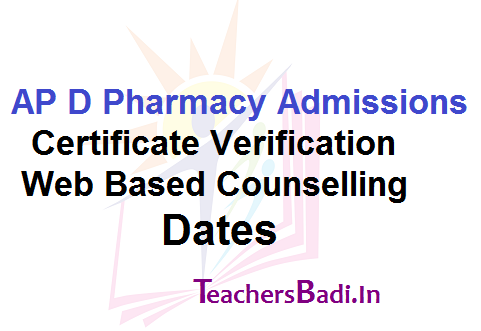 D.Pharmacy Admissions and Web Based Counselling Dates: Department of Technical Education Andhra Pradesh given the D.Pharmacy Admission Notification 2017 and the board invited the online mode applications from the eligible and interested candidates for admission into two-year Diploma course in D.Pharmacy(M.P.C and Bi.P.C. Stream) offered at the institutions under the control of their respective Departments of Technical Education. In this stream eligible and interested candidates were applied and they are waiting for their web based counselling schedule for admission into above said courses. Government of Andhra Pradesh, Department of Technical Education has given D.Pharmacy Admissions 2017 Web based Counselling Schedule and Certificate Dates on 21st August, 2017 for for admission into two-year Diploma course D.Pharmacy course(M.P.C and Bi.P.C. Stream) in Polytechnics, D.Pharmacy Institutions and Private Un-aided D.Pharmacy Institutions. The eligible candidates who have applied to Secretary, SBTET for admission in to Diploma in Pharmacy Course are attend Certificate Verification as per given schedule. 1. Certificate Verification is mandatory for exercising options. 2. Processing Fee to be paid is Rs.1000/- for OC/BC and Rs. 500/- for SC/ST. Certificate Verification of special Categories (both MPC & Bi.P.C. Streams) i.e., PH /NCC / CAP /Sports & Games will be on 30.08.2017 (Reporting time: 09.00 AM) at Govt. Polytechnic , (Near Benz Circle) Vijayawada, only. 1. Govt. Polytechnic, Benz circle, Vijayawada(both MPC & Bi.P.C. Stream). 2. Govt. Polytechnic, Kancharla palem, Visakhapatnam(both MPC & Bi.P.C). 3. S.V.Govt. Polytechnic, Tirupathi (both MPC & Bi.P.C. Stream). 4. G. Pulla Reddy Govt. Polytechnic Kurnool(both MPC & Bi.P.C. Stream). 5. Govt Polytechnic Kakinada(both MPC & Bi.P.C. Stream). 5. Caste Certificate issued by competent authority. Certificate in support of Non-Local Status (For Non-Local Candidates). Certificates to be produced by PH/CAP/NCC/Sports/Minority Candidates: PH-Certificate issued by District Medical Board Candidates with 40% and above disability are only eligible. CAP- Certificate issued by Zilla Sainik Welfare Officer (In case of Ex-Service men) Identity card and Discharge book for verification. Candidates whose parents are domicile of A.P. are only eligible to be considered under “CAP” Category. NCC & Sports- To produce Original Certificates issued by competent authorities. Minorities: SSC TC containing Minority Status or Certificate from the Head Master. Candidates can exercise options from internet cafe or internet facility available at their residence or from any Help Line Centre on the dates mentioned below immediately after Certificate Verification by using URL https://apdpharm.nic.in. However, all the Help Line Centres will work from 9.00 AM - 6.00PM. Allotments will be placed in D Pharmacy Website and Download the allotment order and read the instructions printed and also download challan form for payment of fee.Pay the fees if any, in any Branch of Andhra Bank/Indian Bank. Report to the allotted college on the date mentioned in the allotment order. Failure to report in the allotted college by the date stipulated will automatically result in cancellation of seat and candidate has no claim on the seat allotted. Note: The SC/ST candidates are eligible for reimbursement of Tuition fee if parental income from all sources is up to rupees two lakhs per annum and all other category candidates whose parental income from all sources is upto rupees one lakh per annum are eligible for reimbursement of Tuition Fee. However, Candidate has to pay a special fee of Rs.600/-. 1. Allotments will be placed in Website https://apdpharm.nic.in on 01.09.2017 after 06.00 PM. 2. Download the allotment order and read the instructions printed and pay the tuition fee and submit original certificate in the allotted college.